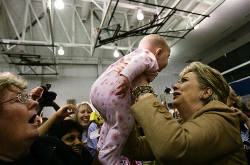 It just struck me why politicians are required to kiss babies. Because to hold a baby and interact with it requires some measure of empathy. Parents recognize real empathy. A politician with children (or even without) that can't fake that--yes, I'm trying to be funny--can't connect. The Bush photo is him hamming it up, obviously, but look at the genuine delight on Hillary's face at right. 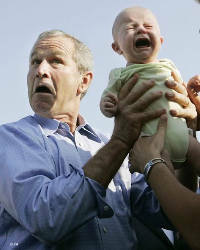 One could argue that by mirroring the baby's expression, Bush is showing true empathy, too, just not of the appealing kind.